Toshiba shows off the Qosmio F750, a new 15.6" laptop with a glasses-free 3D display. The system will ship in August 2011. Toshiba UK today announces the launch of the Qosmio F750 3D – a revolutionary new laptop with the ability to display mesmerizing 3D images without the need for 3D glasses. The Qosmio F750 3D can also display a combination of 2D and 3D images on screen at the same time, while a range of powerful, high-performance multimedia features ensures the laptop is perfect for even the most demanding tasks. 3D unplugged The Qosmio F750 3D is designed for those looking for the ultimate 3D experience. Like the world’s first glasses-free 3D television – the Toshiba REGZA GL1 – the Qosmio F750 3D uses a special lenticular 3D screen to give users the freedom to experience all the benefits of 3D entertainment, without the restrictions of having to wear 3D glasses. Glasses-free 3D technology adds a truly immersive element, perfect for experiencing 3D in a more natural and comfortable way, particularly for those that may already require prescription glasses. The 39.6cm (15.6″ ) screen also offers Full HD resolution for clear, vivid images, while a 120Hz refresh rate eliminates blur or ghosting with the fast moving images seen in action films and games. To create a 3D effect without 3D glasses, the left eye needs to see a slightly different perspective to the right eye. The Qosmio F750 3D’s state-of-the-art lenticular screen displays 3D images without the need for glasses. Eye-tracking technology ensures 3D effect works regardless of position. 39.6cm (15.6″ ) screen allows 2D and 3D images to be viewed simultaneouslytwo images of slightly differing perspectives individually to the left and right eye, which creates the 3D effect. An integrated webcam also intelligently tracks the user’s eye movements, allowing the Qosmio F750 3D to adjust the 3D effect to match the eye position. The Qosmio F750 3D can also display 2D and 3D content simultaneously – allowing users to browse the internet, for example, in one window and have 3D content playing in another window. The glasses-free Qosmio F750 3D offers a unique way for businesses, professionals and designers to present 3D content. New product concepts, architecture plans, medical information or educational tools can be viewed with unparalleled realism and greater depth. Premium features including second generation Intel® CoreTM i processors and the latest 3D graphics from NVIDIA® ensure the Qosmio F750 3D handles demanding programs and the latest video games with ease. Integrated stereo speakers designed by audio-specialists Harman Kardon® produce distortion-free, punchy sounds, working with Dolby® Advanced Audio optimisation technology to provide truly a cinematic experience. In addition to integrated Blu-rayTM XL support, the Qosmio F750 3D also features Toshiba’s 2D-to-3D technology – a complex algorithm that takes ordinary 2D DVD content and instantly converts it into 3D. For those wanting to enjoy 3D Blu-rayTM content on a bigger screen with family and friends, the Qosmio F750 3D easily connects to any 3D-ready HDTV via HDMI. Wi-Fi (802.11 b/g/n) provides users with a fast and reliable wireless internet connection, while USB 3.0 and Bluetooth 3.0 with High Speed support offers incredible transfer speeds between the laptop and peripheral devices. 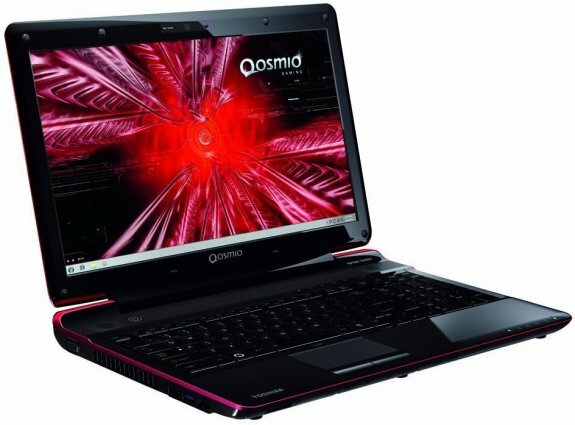 The Qosmio F750 3D is available in a Shiny Red finish, and features a distinctive wavelet pattern across the chassis lid, while a carbon pattern on the inside palm rest gives the laptop a premium finish. Additionally, the EasyControl bar includes seven dedicated buttons, sat above the matt black keyboard, providing users with feather-touch control over multimedia and 3D features.